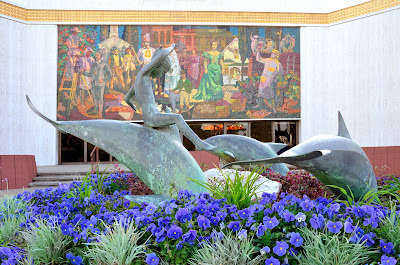 Last summer we told you about the "Child on a Dolphin" sculpture in front of Anaheim's Chase Bank. Back then, the bronze sculpture, which had originally decorated the bank's fountain since 1970, was sadly in need of some love. 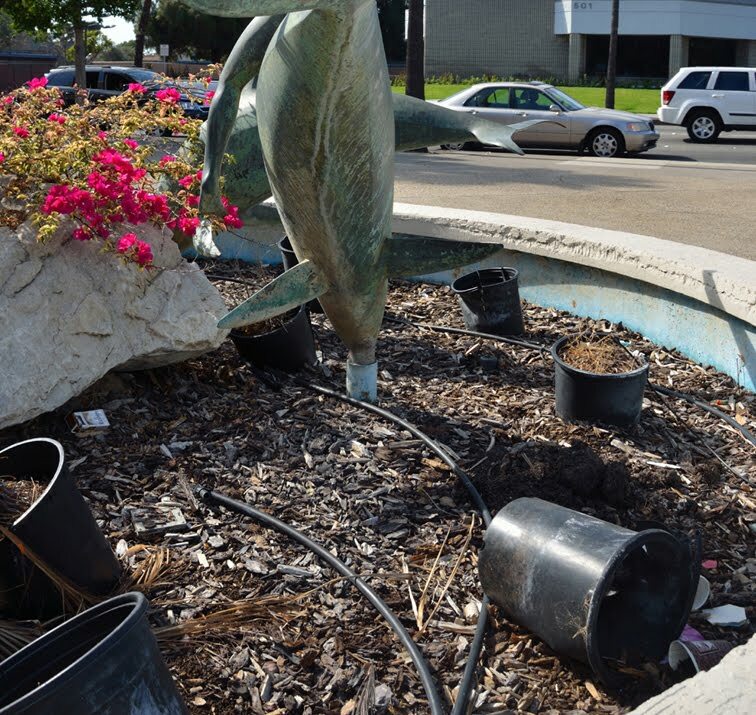 Dead plants and litter filled the basin, and generally things weren't looking too good at the corner of Harbor Blvd and Lincoln Ave.
Well, as you can see in the photo above, that has all changed for the better. Chase Bank cleaned out the basin, installed a watering system, and planted fresh flowers all around. Not only do the boy and his trio of dolphins look happier, the entire intersection feels classier. We applaud Chase Bank for taking pride in their property and the neighborhood, and giving a piece of public art the respect that it deserves. Three cheers for Chase! Here's the situation back in August 2011. We expect everyone who lives and works in this city to take an active part in keeping Anaheim clean and beautiful. It begins with all of us. Pick up litter whenever you see it and throw it away. You've got two hands and it only takes a second, so get yourself into the habit. Do not tolerate graffiti or tagging, and teach your children to respect their neighbors and the neighborhood they live in! Anaheim is a beautiful city, and with all of us making a conscious effort, it can easily become even better. 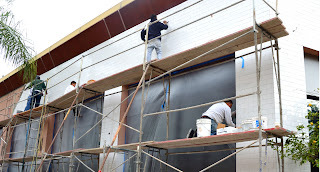 Tile artists busy at work. Looks amazing, fellas! 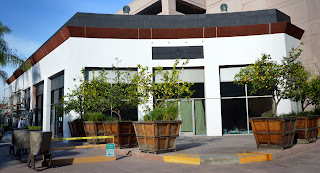 Boxed citrus trees provide a temporary barricade as 195 Center Street undergoes a transformation. We Want To Be LIKED By You! 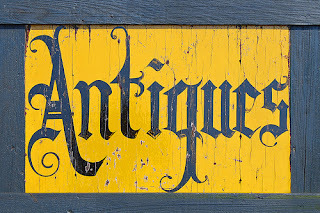 The Anaheim Historical Society Facebook Page is a happening place right now, with over three hundred fans swapping stories, photographs, and memories of our world-famous hometown. Anaheim is like no other city on Earth, visited by an estimated 45 million people every year, and yet it has retained a “small town” vibe in many ways. 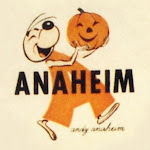 Always evolving, Anaheim has countless stories to tell-- from its early pioneer days as a German settlement producing wine and beer, to the arrival of Disneyland which transformed our landscape forever. 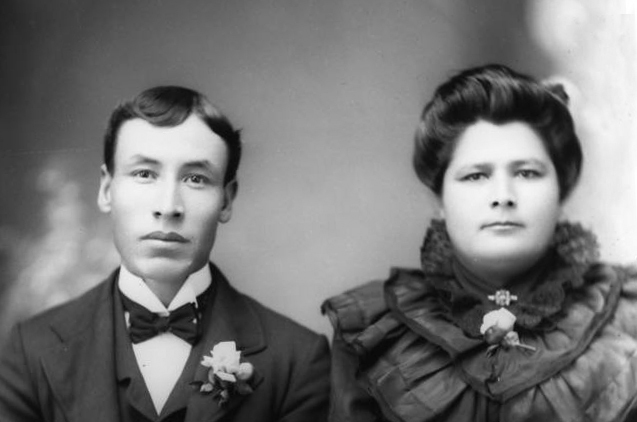 Romantic, homespun, quirky, sometimes tumultuous, and frequently over-the-top, the story of Anaheim is classic Americana. 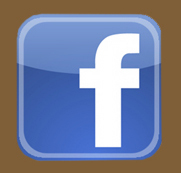 Come “like” us today and add your voice to the story! Orange trees and a row of fully-grown eucalyptus trees on the outskirts of Disneyland during the autumn of the park's opening year. Today, the orange grove is gone, but amazingly those eucalyptus trees have survived. You can see them today as you face the Storybook Land attraction. 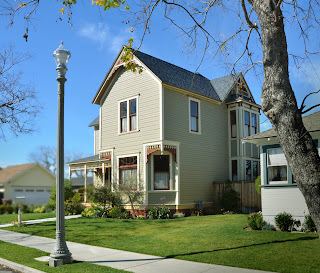 The trees were planted over a hundred years ago by Anaheim farmers as a windbreak to their property line. This Saturday Night! 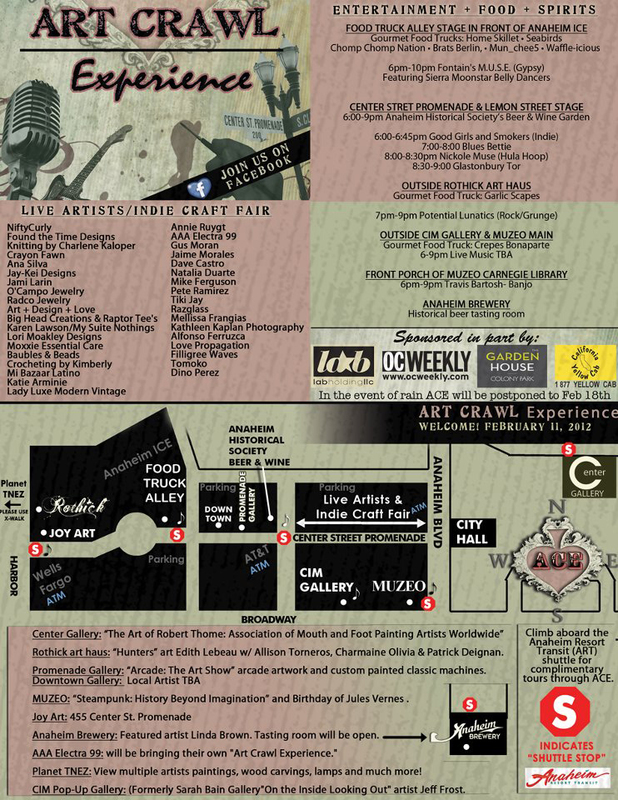 Anaheim Art Crawl!!! “ACE” Art Crawl Experience on the Center Street Promenade. 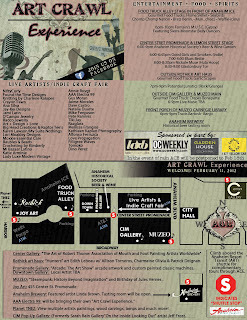 February 11, 2012, 6PM to 10PM. 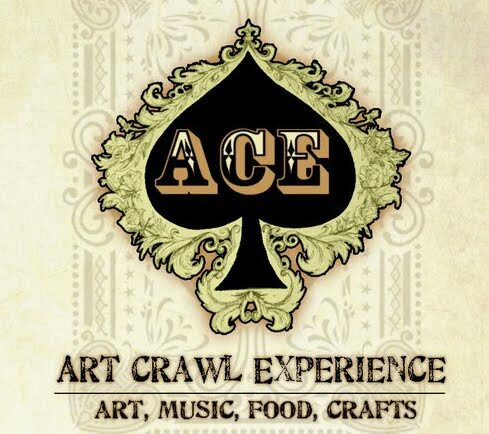 Art, Crafts, Live Music, Food and a chance to preview some of the improvements being made to Center Street. Stop by for a famous Anaheim Beer in the beer garden at the Good Food Hall, hosted by the Anaheim Historical Society-- and your friends can join the AHS! 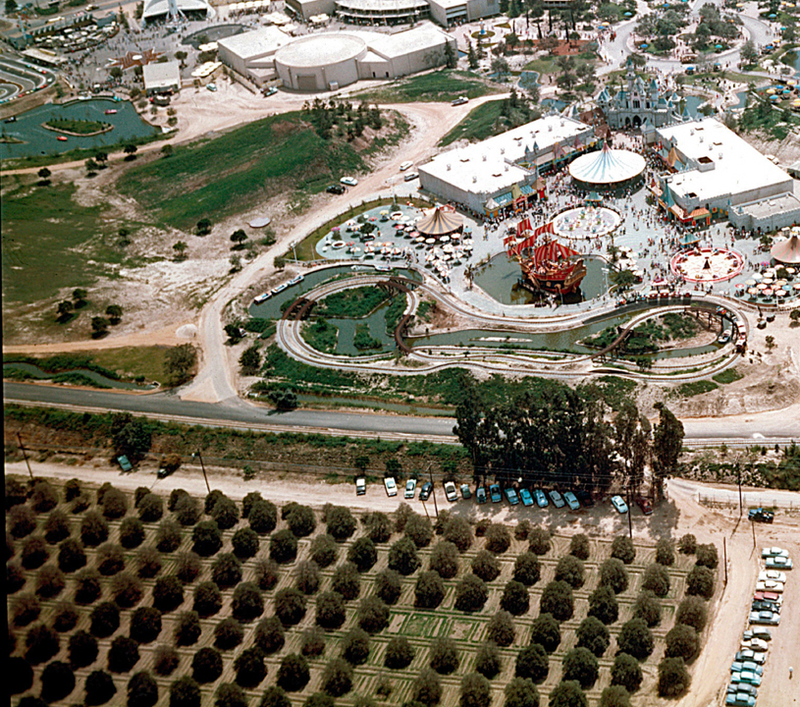 Whenever we find an old photograph of Anaheim that we haven't seen before, it's like discovering a map to buried treasure. Photos are the keys to a lost world, letting us explore forgotten places right in our own neighborhood, hidden under layers of progress and development. Take, for instance, this recently unearthed image of Harlow's Service Station at the corner of Elm Street and Anaheim Blvd (then called Los Angeles Street). In the late 1920s and '30s motorists stopped here to fill up on St. Helens Gasoline or to buy a quart of motor oil for 25¢, made of petroleum from the nearby Whittier oil fields. 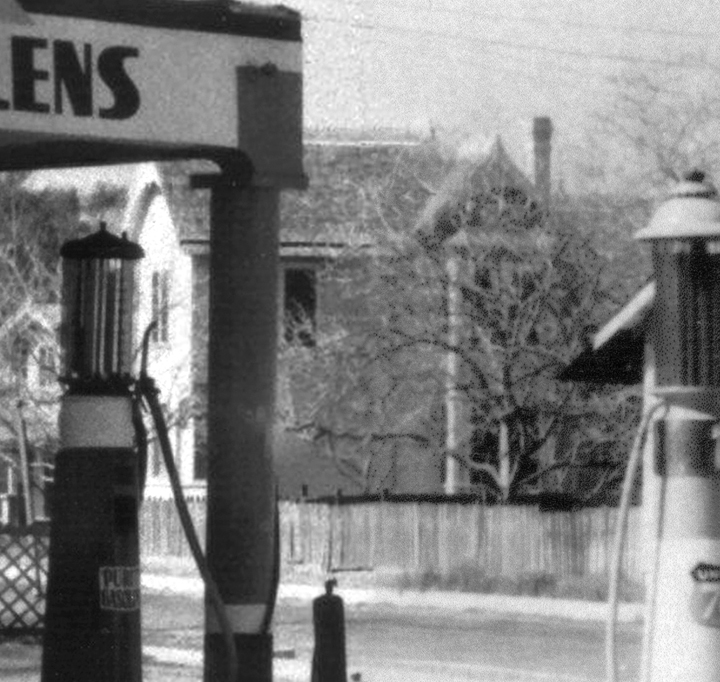 The photo shows a quaint gas station built at an angle to the street, with hand-painted signage and glass-topped fuel pumps. The Kate and Ella Rea House today. 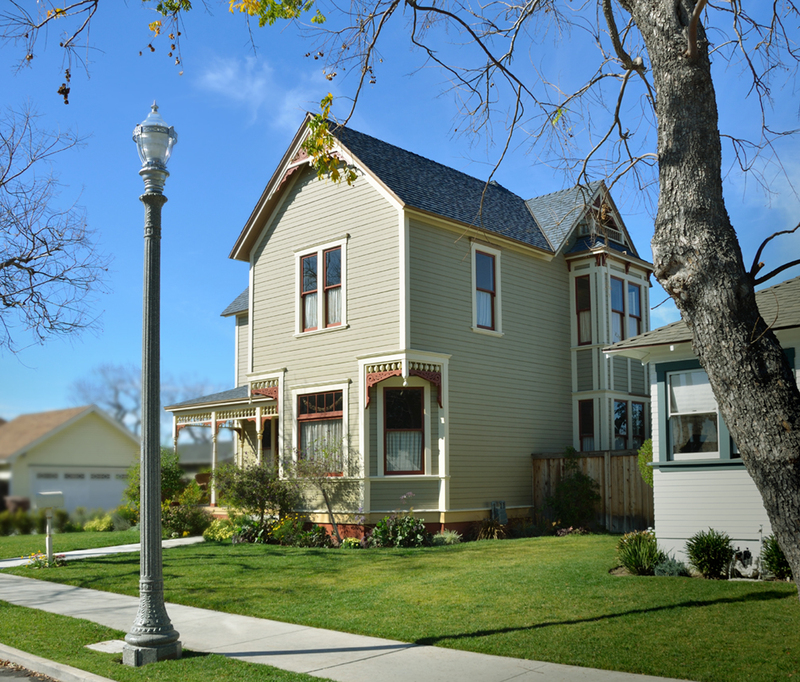 The decorative roof railing, removed decades ago, will be restored this year! The Harlow's Service Station photo shows another building that has remained pretty much unchanged in 90 years, as well. 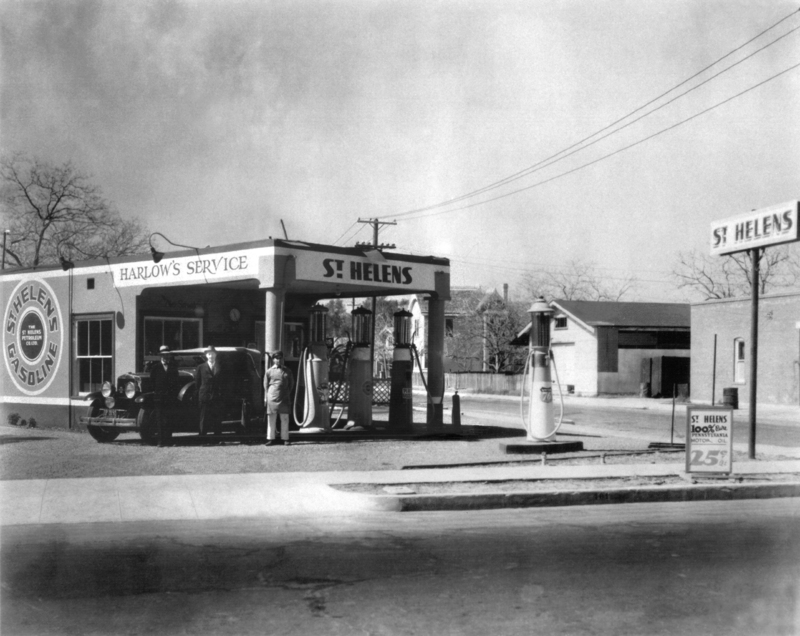 On the far right of the image, behind the St. Helens sign, is the back end of a brick building with a window. That building survives today as the location for two popular restaurants, Punjabi Tandoor Indian Food and Lindo Michoacan Mexican Restaurant. 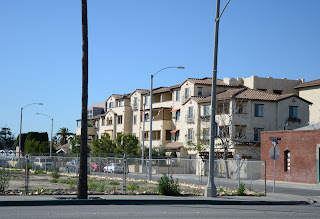 The row of houses has been replaced by a monstrous high-density residential complex, and the telephone lines have moved underground. 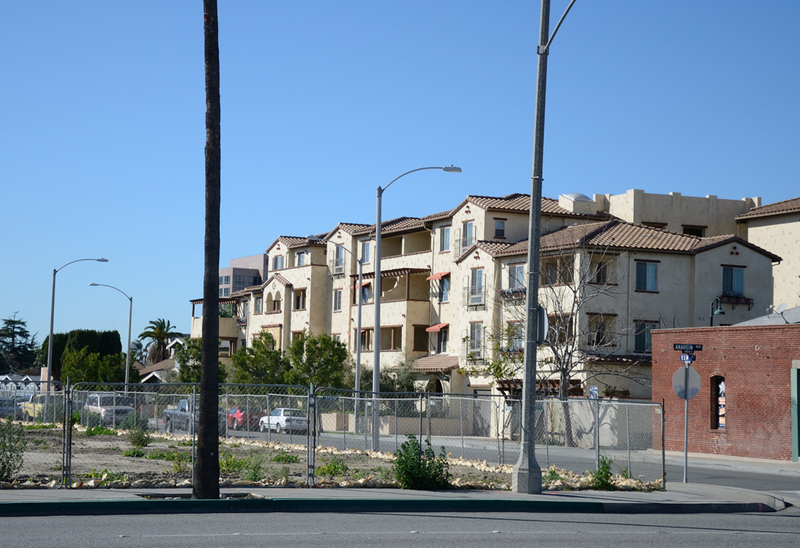 The corner of Elm and Anaheim Blvd. today. Though it doesn't look very pretty at the moment, this area is about to be redeveloped for future use. The old lot itself was recently fenced off and many ideas are being discussed for this major parcel of historic Downtown Anaheim. What would YOU like to see built here?